Prog rock pedigree? Check. Reputable prog rock label? Check. An obligatory thirteen-year gap in albums? Check. 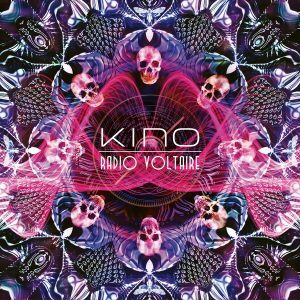 The latest album from English progressive rock trio Kino, Radio Voltaire, checks a lot of boxes. 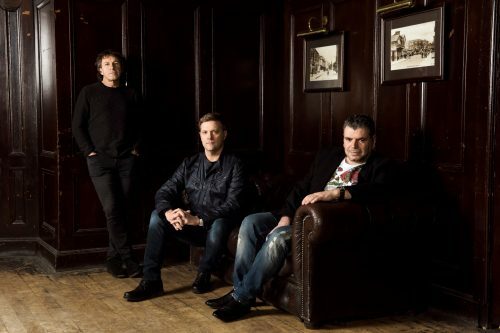 This is the band’s second album, the first being 2005’s Picture, but the gap between records is not indicative of lethargy: founder/guitarist/vocalist John Mitchell is the driving force behind Lonely Robot and a couple of other prog bands, while partner-in-crime Pete Trewavas is the bassist for Marillion. This time around the band also features Steven Wilson’s drummer, Craig Blundell, and former Kino member John Beck as a guest on keyboards. Lots of name-dropping there, which raises this reviewer’s expectations. Shall we see if those expectations are met? Well, not at first. “Radio Voltaire” is the opening track, and is a lush pop song. And it’s long — seven minutes. It sounds great in every respect, and Mitchell does say up front that Radio Voltaire is a pop album, but he stresses that it’s an album they “mess around” on. Not on the title track, which comes off as a very rote number, lacking any hint of progressive pretention. Thankfully, the rest of the album ups the ante, infusing the pop sensibilities of Mitchell’s and Trewavas’s songwriting with plenty of progressive movements. “The Dead Club” is an energetic rush of guitars and synth that wouldn’t be out of place on older Porcupine Tree releases. The introduction to “Idlewild” invokes Peter Gabriel’s “Wallflower,” but on piano rather than synth, and standout tracks “Grey Shapes on Concrete Fields” and “Out of Time” are catchy and addictive, with excellent arrangements and, in the latter’s case, a bass solo to boot. Those familiar with Mitchell’s work over the past decade know what his vocals are like: a pleasant voice that holds a certain amount of smoke and whiskey, much like Peter Gabriel. Mitchell surely knows this and often sings in Gabriel’s style of a hushed whisper. It’s very effective, and his guitar playing is also equal to the task. It’s stylish and utilizes great tone. Not to be outdone, the rhythm section of Blundell and Trewavas absolutely shines. These guys are masters of their instruments and you can see why Blundell is Steven Wilson’s drummer of choice these days. It doesn’t get much tastier, but the added keyboard embellishments from both Beck and Mitchell are the icing on the cake. Kino know how to bring it musically, allowing us to ignore the DR score: Radio Voltaire sounds fantastic. There really isn’t much to complain about on Radio Voltaire. Aside from the long, unimpressive title track and a few other rather staid moments, the rest of the album is an outstanding journey through progressive pop. Those of us who dug To the Bone will also love Radio Voltaire, and perhaps that could be construed as a slight negative: this sounds very much like something Steven Wilson could have put out. Maybe not quite the innate pop knack Wilson has but in much the same vein. Bigger chances could have been taken in the arrangements to give the album a more progressive feel, as “Radio Voltaire” and “Idlewild” both come off rather tame. In other words, the band doesn’t mess with pop constructs as much as they could. With that being said, weeks of listening confirm Radio Voltaire’s solid likability. While none of the cuts are SOTY nominees, the album will continue to get ample playing time in my collection, and certainly has a shot at being one of my favorite prog albums come year-end time. Kino have woven a rich tapestry of progressive pop that is the perfect palate cleanser after months of winter doom.